Admire the picture-perfect scenery, deep blue sea, and idyllic islands surrounding Ang Thong National Marine Park, a beautiful archipelago of 42 islands. Take part in an authentic cooking class, and learn how to incorporate the spicy flavors of Thai cuisine in your dish. 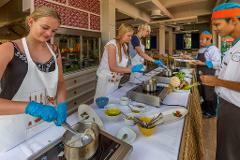 Expand your taste buds, and test out your skills as you learn to cook traditional Thai meals beside gorgeous sea views. Cast off and head into the waters of Ko Samui for an exciting fishing tour. Throw your line in along the beautiful islands of Ko Mudsoom, Ko Tan, Ko Rarb, as well as Wang Bay. Combine a spectacular cruise with a delicious buffet meal off the coast of Ko Samui. Immerse yourself in the pristine surroundings of these beautiful islands. Ride along the interior dirt tracks of Ko Samui on a powerful 4-wheel ATV bike. Get your adrenaline pumping with an exhilarating outdoor experience and enjoy the scenery of the Thai countryside. Enjoy an amazing adrenaline rush as you take on challenges at Sky Fox, a world-class outdoor zip-line park. Discover the culinary wonders of Koh Samui during a private dining experience on the beach at night. Create memories to last a lifetime with a 4-course Thai dining experience at Amari Koh Samui on the beach. Spend a relaxing day cruising the waters around the stunning Ko Samui. Visit famous, pristine beaches at idyllic islands—Koh Tan and Swallows Nest Island—discover popular landmarks, and enjoy a scrumptious lunch at the beach restaurant. Admire the spectacular archipelago of the Ang Thong National Marine Park by sea kayaking across crystal-clear waters. The Thai Experience is a brand new dining concept designed to be the ultimate dinner party. A 15 dish, 4 course created by both Thai and foreign chefs to enjoy over delicious cocktails with new friends.